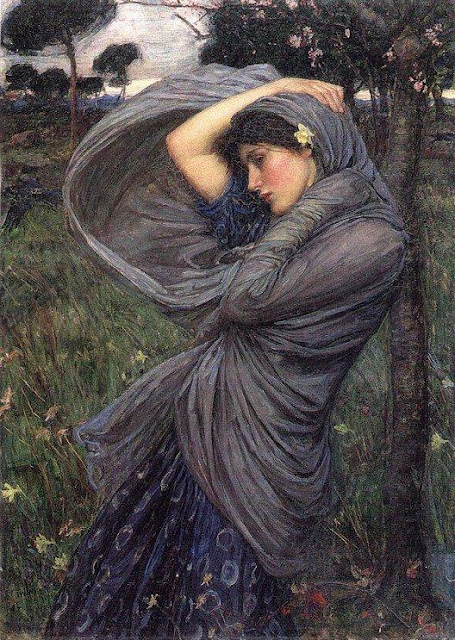 We are certainly a windswept bunch this month with our Waterhouse painting of the north wind blowing to get us inspired. Grays and blues with a hint of yellow and pink and green was on most of our palettes this month. It certainly looked like that to me outside where I am! Enjoy this blog tour as we honor Boreas, the North Wind (and wish that Zephyros, the Greek god of the calm spring breezes, would come quickly in its place!). Calling on the palette of deep blue, slate gray and green, Tracy Stillman whipped up this lovely bracelet filled with movement of the blowing wind in the tinies little seed beads adorning the spaces. I love the asymmetrical balance that she devised with this design. Lynda of Fresh Baked Designs really got into interpreting the painting. She tells us that not only are the colors inspiring but ther mood is as well. 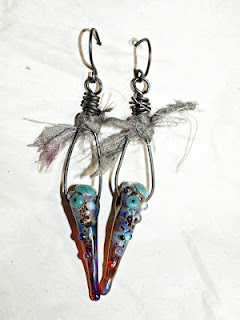 Lynda gave us a windswept design featuring steely gray wire and a butterfly on the wing. Creating something special to honor the loss of someone dear, Kimi of Kimis Jewelry From the Heart sculpted the face of this wind swept beauty from polymer clay and added so many charming details. What a beautiful and meaningful work of art! Cece Cormier (above), the Beading Yogini, brought this young pre-Raphaelite beauty to life with her mix of materials and textures. I love the triangular shape of the focal in the perfect shade of daffodil yellow that really draws my eye to her sweet face. A lush garden of glass beads is what Pam of KlassyJoolz has created this month. Her bracelet brings out the textures in the dress and the swirling shawl as well as the rustling grasses. I can feel the movement of the wind in this beautiful bracelet. 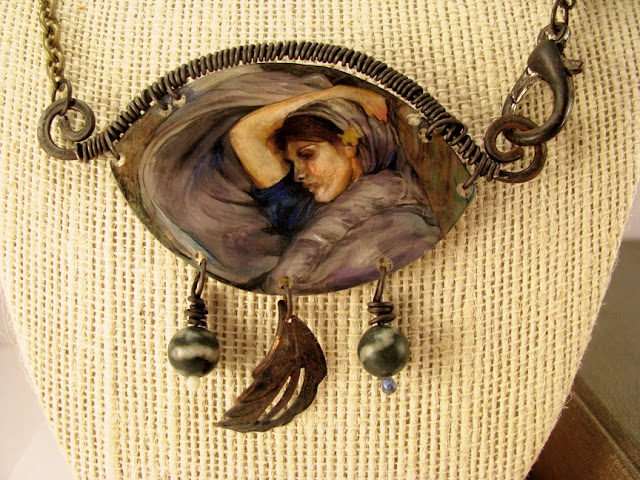 The swirling North Wind is the muse of Cindy (above) of Devine Designs Jewelry. 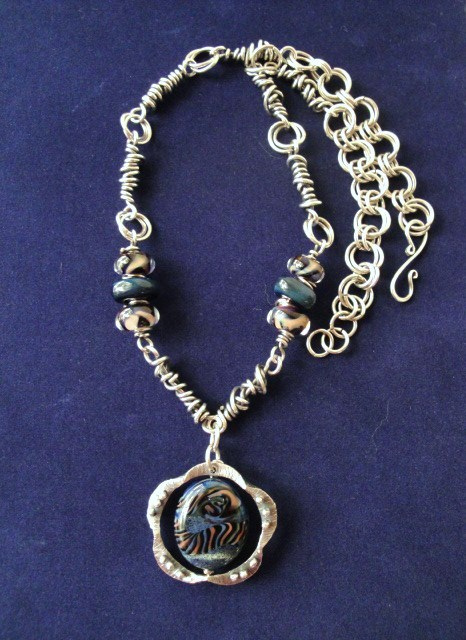 The hand forged elements add a classic touch to this organic necklace. Just beautiful craftsmanship! Beth and Evie McCord of EB Bead And Metal Works elected to focus on the face of Waterhouse's beautiful model for their hand sawn and enameled focal. The colors of their lampwork beads are soft and pretty and I can feel the wind whipping her scarf around her through the gray silk ribbon winding around this piece. Kym Hunter (above) went the abstract route for her submission. These intriguing glass spikes, the trapeze made of steel wire and the pop of buffeting gray silk all bring the pretty palette to life. Thank you for sharing these beauties! Sometimes we make things for sale and sometimes we just can't part with them. That is the case with the pretty bracelet made by Three Trees Art. Combining a variety of textures and shapes with the soft earthy blues, grays and taupes makes this something special. I don't blame you for not wanting to part with this! Clay is such a freeing material to work with because it can be transformed into so much. 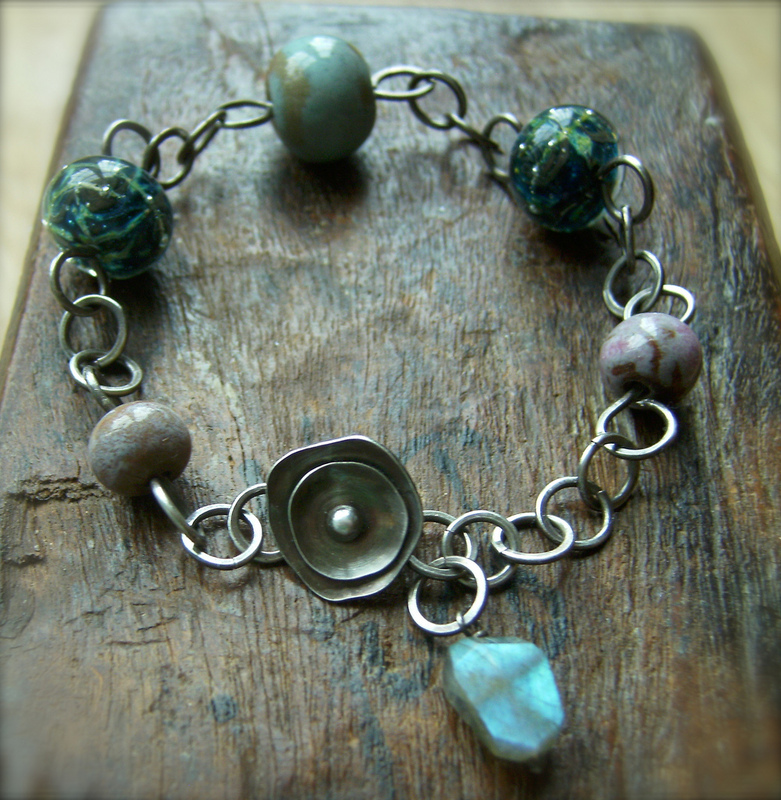 Emma Todd of A Polymer Penchant is kicking off her new blog showing us the beautiful mysterious blue beads that she made to go with this month's challenge. Please hop over and welcome her with an encouraging comment! Miss Jenna of Honey Bijou (above) has no limits to where her creativity will take her next. She decided to reproduce the young lady in the painting on shrink plastic. Amazing! The detail and the mastery of illustration with this design, not to mention the beautiful wire wrapping skills. 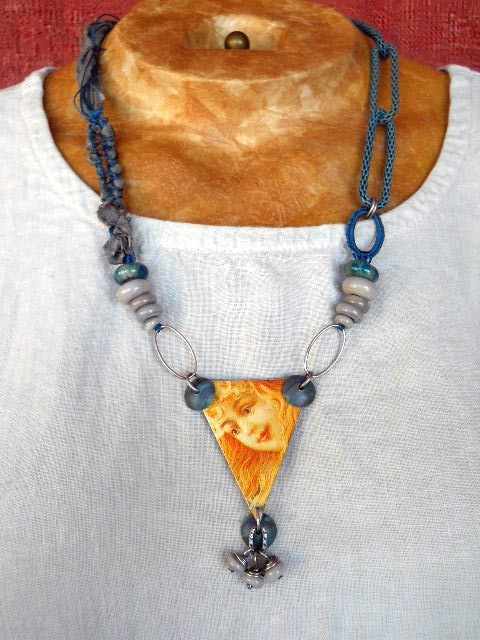 What a stunning piece of wearable art! Sometimes the inspiration comes easy. Sometimes the execution of that inspiration is hard. That is what Sharyl of Sharyl's Jewelry & Reflections writes about in her post. I am glad that she persevered and come up with such a romantic design to share with us all! Picking up on the pattern in the girl's dress, Niky of SilverNikNats (above) found the perfect focal element for her bracelet that projects a lot of strength to stand your ground in the windswept fields. I am not sure how she does it, but Mary Ellen of Bee Tree by m.e. is almost always the quickest to respond to our call. Her creativity is always at the ready and this month she literally invoked the North Wind to come and play with her design. She has a book filled with sketches of ideas and this time she even challenged herself to come up with a new concept. Bravo! We are so happy that all of you keep sharing your creativity with us! Please remember that if you have a blog post for your challenge piece, to either put it in the challenge post at the beginning of the month or better yet, in the description of your picture on Flickr. There are so many more great designs that didn't have blog posts so I hope you will go and view them in the Flickr site! I look forward to re-visiting each wonderful entry . I Love the monthly blog hop! Wonderful creations! I particularly like the painting recreation pendant done by Honey Bijou! Nice work everyone. I'm always blown away by the varity of beads, design, and techniques from all the artists. I've enjoyed the blog tour! Thanks for taking the time to put this together. What beautiful designs this month! I was kind of hitting a "bead wall" but now feel very inspired so it's off to the studio!